This lesson plan was developed specifically for use with the PhET simulation "The Moving Man". 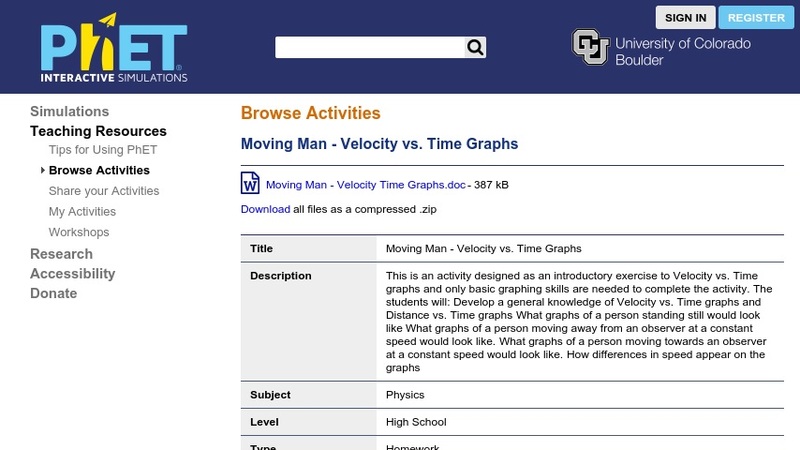 It is intended to help beginning students differentiate velocity vs. time graphs from position vs. time graphs, and also to promote understanding of multiple frames of reference in analyzing an object's motion. Only basic graphing skills are required of the student. The lesson was created by a high school teacher under the sponsorship of the PhET project. SEE RELATED ITEMS for a link to "The Moving Man" simulation. which must be running to complete the activity.